Large-scale high school trip part of Jewish Agency efforts to increase French Aliyah (immigration). A full 1,100 high school seniors from twenty-five Jewish schools across France celebrated the third night of Hanukkah in Jerusalem Thursday, as part of the Jewish Agency's ongoing efforts to reach out to the French Jewish community. The teens were joined by Chairman of the Executive of The Jewish Agency for Israel Natan Sharansky, who lit the Hanukkah menorah and said that the high schoolers' visit to Israel is "a massive expression of solidarity that reflects the warm and unique connection between the French Jewish community and the State of Israel." Participants enjoyed performances by Israeli singer-songwriter Yonatan Razel and IDF Chief Cantor Lt. Col. Shai Abramson, accompanied by the IDF Rabbinate Troupe. Bac Bleu Blanc ("High School Seniors in Blue and White") is a program run by The Jewish Agency for Israel, with the support of Keren Hayesod-UIA, that brings French Jewish high school seniors to Israel on a one-week educational trip every winter. Since Bac Bleu Blanc's creation eleven years ago, some 10,000 students from twenty-five French Jewish high schools have come to Israel as part of the program. This year marks the program's twelfth session, and for the first time ever, several dozen Jewish students who attend French public schools are participating, as well. During the course of their time in Israel, participants visit various sites of educational and historical significance, meet with their Israeli peers, and are exposed to institutions of higher learning and gap year programs operated under the auspices of Masa Israel Journey, a partnership between The Jewish Agency and the Government of Israel. 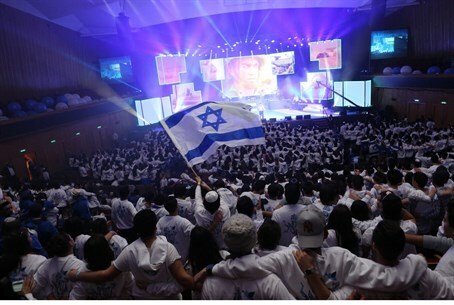 Each year, thousands of French Jews come to Israel on various Jewish Agency programs, including Bac Bleu Blanc, Masa Israel Journey, Onward Israel, and ultimately Aliyah (immigration). French Jewish immigration to Israel is at an all-time high, with more than 6,600 immigrants arriving so far this year, more than double the 3,288 who came in all of 2013 and triple the 1,917 who came in 2012. The high schoolers' visit serves as an initial pilot trip, and many participants will return to Israel for lengthier stays.